Powered by a Hybrid 4-cylinder engine, the Toyota Prius manages excellent fuel economy while offering seating for five and generous cargo space. It is not strong on performance, though. The Toyota Prius is completely redesigned for 2004. The new Prius is larger and more roomy inside than before, with back seats that seat two adults and lots of cargo space. It's also more pleasant to look at with futuristic styling. Its highly efficient 1.5L 4-cylinder engine is rated at 60/51 mpg. 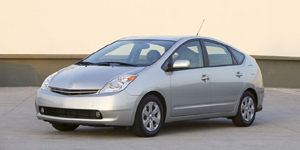 The 2004 Toyota Prius Sedan is powered by a 1.5-liter Inline-4 with 110 hp. Find the used Toyota Prius of your choice from a dealer in your area. Search our used car listings now.